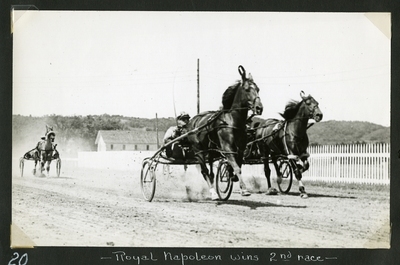 Black and white action photo of chestnut stallion, Royal Napoleon, wearing head number one, Toole up winning the first heat of the 2.21 Pace at the Cornish Early Meet on Thursday, June 30, 1938 at Cornish, Maine. Bay stallion Harkaway, wearing head number four, finished in second. Symbol Green crossed the line in third while Cash Counter rounded out the field in fourth place.